Vose Galleries - Washington Must Stay Here! So pleaded the City of Boston’s poster to sway her citizens, in honor of the city’s 325th anniversary, to purchase a mammoth oil painting by Emanuel Leutze depicting the most famous event of the Revolutionary War. This portrait, which stands 10 feet high, shows General Washington, March 17, 1776, standing on the summit of Dorchester Heights, now South Boston, watching the entire British Army of 2,000 redcoats aboard 150 ships, retreat out of Boston for Halifax, Nova Scotia. Robert C. Vose, who had acquired the painting directly from the family that had commissioned it in 1852, desperately wanted this monumental epic to remain in Boston. He showed the piece to Mayor John Hynes who upon seeing the painting remarked “we must have it.” Vose, Hynes and 75 prominent citizens joined together to make a public appeal to raise the $7,500 purchase price. Mayor Hynes’ appeal received a trememdous public response due to the painting’s dramatic story which took place over 75 years earlier. Having lost the Battle of Lexington and Concord just eleven months before, the Americans were overjoyed when Colonel Ethan Allen and his "Green Mountain Boys" defeated the British near Fort Ticonderoga, New York. American troops hauled the captured munitions, some 70 cannons weighing more than 105,000 pounds, 300 miles by oxcart to Boston through the winter snow. 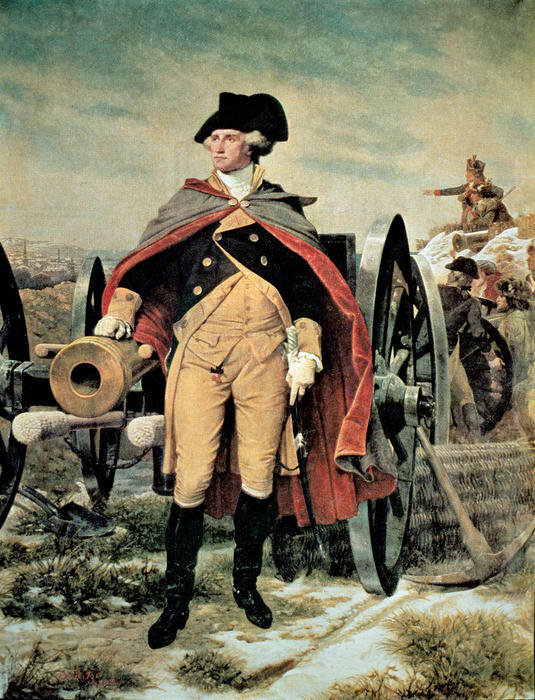 General Washington quietly surrounded the town and harbor with the powerful guns. British commander Lord Howe, stunned and unable to mount an attack because of violent weather, struck a deal to evacuate the city if Washington would hold his menacing cannon fire. Washington readily agreed and news of the victory soon electrified American patriots throughout the thirteen colonies. Less than four months later, the Continental Congress, armed with a new sense of confidence, proclaimed the "Declaration of Independence," marking the beginning of a new nation. It took only four months to raise the money, and in 1955, the piece was sold to the city of Boston. Today, George Washington at Dorchester Heights hangs in the Boston Public Library’s Washington Room.